Sportsbet.io is the sports betting front of the cryptobased gambling company CoinGaming.io. The focus here is mainly on betting on sports, but you can also find a full-fledged casino on their site as well. Their product is a very simple and sleek website, and I mean that in a good way. There is not a lot of buttons, banners and text featured on their pages, which makes it easy to make out what you want to do and accomplish on each of them. When you login for example, you see a big green button at the top saying "Deposit" which makes it easy for you to get started funding your account right away. 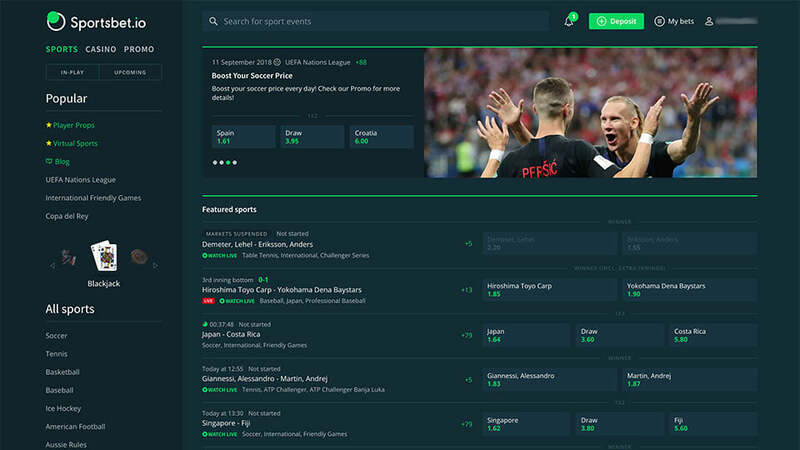 So with Sportsbet.io you will not get the super-flashy betting experience, but rather a functional one that delivers what you want: a solid online betting experience. The welcome bonus at Sportsbet.io is solid: deposit funds, place your first bet and receive 300% of your bet, up to €30 (or currency equivalent), in free bets within 48 hours. Good way to try out their sportsbook without having to deposit too much money right away. A promotion for the NFL where you can get back your bet in the form of a free bet if your team wins, but fails to cover the spread. So if you had bet on the Green Bay Packers -8.5 in Week 1 of 2018 NFL season, you would have gotten back your bet as they won their game, but failed to cover the spread. This promotion is for bets at exactly €12 (or currency equivalent), and they will credit you your free bet by 12:00 GMT the following day. It is as simple as it says: find a bet you like, click the blue button "Price Boost" to see your improved price and win more if your bet comes in. These price boosts are one per day, but it resets every 24 hour, so you can get another one the next day if you want some more juicy odds. Play in the casino at Sportsbet.io and you can win the holiday of a lifetime! Each of the adventures have their own leaderboards with tiered prizes, so keep playing during the alloted time for the games to be able to win a VIP trip to Paris or other cash prizes. The betting odds offered at Sportsbet.io are solid and there is a wide variety of sports you can bet on, even niche events like Volleyball, Futsal and Pesapallo. But our focus for this review is on their cricket betting offerings. You will find that they have odds on most of the bigger matches in cricket, including a wide variety of prop bets and player bets. The odds they offer are not the highest in the market, but definitely competitive with the market in general. They do lack a bit of outright bets and are not the earliest in putting out odds for events coming up further into the future, but that is not a big deal unless you plan on putting your money down on bets way in advance of the games starting on the regular. In addition to many other sports to bet on, you can also place wagers on virtual sports if that is your kind of thing. Computers play games of sports against each other, and you can bet on various outcomes, just like regular sports. There is also a casino with a stack of games for you to play, including live casino for those that prefer to watch the real thing unfolding. Sportsbet.io is also the first online operator to offer live version of the popular Indian game Andar Bahar. If you want to place some bets on that, you definitely need to check them out. The main currencies used are cryptocurrencies like bitcoin. If you haven't heard about bitcoin by now, you might be living under a rock. They have also recently added the possibility to deposit in Euros (€) as well, so for those that are still new to cryptocurrencies and want to deposit the old way, you can do that using Neteller, Skrill or credit cards. 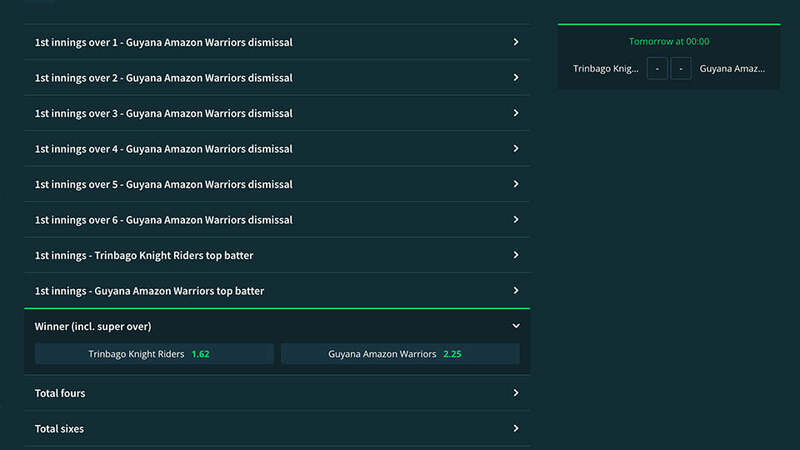 There is also the option to use deposit options like Astropay, Muchbetter and Jeeto as well, and they are continuously adding more options for funding your betting account. If you are from Brazil they also offer the option to deposit through various agents as well. Check out their website for a full list of them. It is a little annoying that you need Flash to use their casino though, so a problem for Apple users there. As for safety, Sportsbet.io has taken the step to add Google Authenticator to their services, which gives you an extra layer of security. Google Authenticator needs a smartphone to work, but is very easy to setup and use, and we highly recommend that you do set this up on your account to protect your funds. Sportsbet.io is a very good looking website, which works as well on desktop as it does on mobile. It is simple in it's design, have plenty of bets offered on their site, in addition to a big casino full of various gambling games to try out. 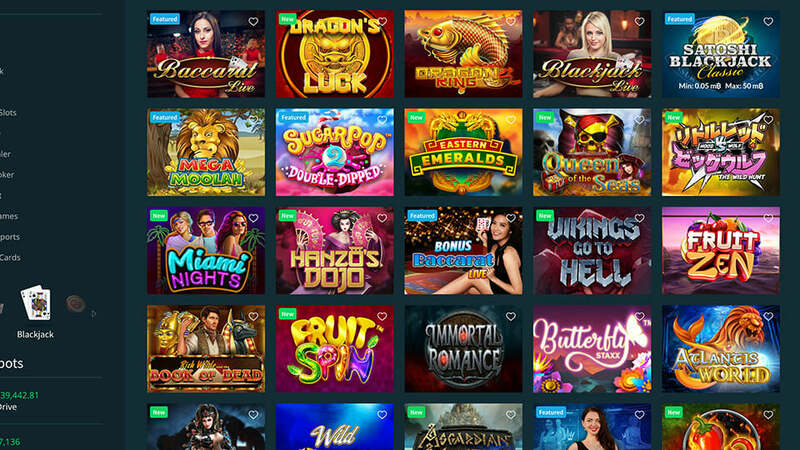 There is also many betting promotions for you to choose from, so you should always have something to play for when logging into their site to play.